In our last blog we talked about the many ways that you can check for hidden leaks in your home if you suspect something is up. These included checking your monthly water bill, your water meter outside, and a few other handy tips to ensure that you can detect the leaks before you have to call an emergency plumber in the middle of the night. So we talked a lot about how to detect leaks, but we didn’t spend a whole lot of time on why you should do everything you can to get leaks taken care of by a plumbing company as soon as possible. Here are the top four reasons you need to make those leaks go away! Here’s one of the most obvious reasons to get those leaks under control: it wastes water. Colorado isn’t exactly desert, but it is an arid climate. And while we’re lucky to get our fresh water from the mountains, growing populations across the front range can lead to water restrictions nearly every year. It’s important to keep our water usage under control so that everyone can enjoy full lakes and reservoirs for boating and fishing. Of course, if you’re wasting water, you’re wasting money. You might not think that a leak can cost you that much, but a bad leak, whether inside or outside your home, can double your water bill. Water is a precious resource, and while it doesn’t cost that much relative to the benefits we get from it (and the tiny effort we have to put into it to get it), you’re sure to notice when your water bill increases by such a large amount. Like me mentioned up above, Colorado is an arid environment. But that doesn’t mean everything dries up right away. Water that’s been sitting on wood and drywall can give mold spores the moisture they need to thrive. Once it’s taken hold, it takes a lot of work to get it off of your joists and from behind the remaining wall. And unfortunately, that water that was up above is now soaked into your carpets and hardwood floors below. 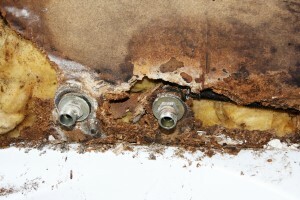 The threat of mold is a great reason to deal with leaks at the first sign of trouble. Like we’ve mentioned, it’s important to take care of any leaks you’re aware of immediately so that you’re not wasting water or dealing with the terrible consequences of a leak in your wall. Whenever you have the first inkling of problems, give you local plumbers a call for help.